The preparation of the Parish profile is progressing well and is now part of a Deanery programme led by the Rural Dean, Nick Brown, who will be joining the next meeting of PCC representatives from the seven churches on Saturday 9 September. The aim is to complete the profile by the end of October. It is important that time is allowed for careful preparation and prayer before finalising this document; any thoughts on the future would be appreciated. 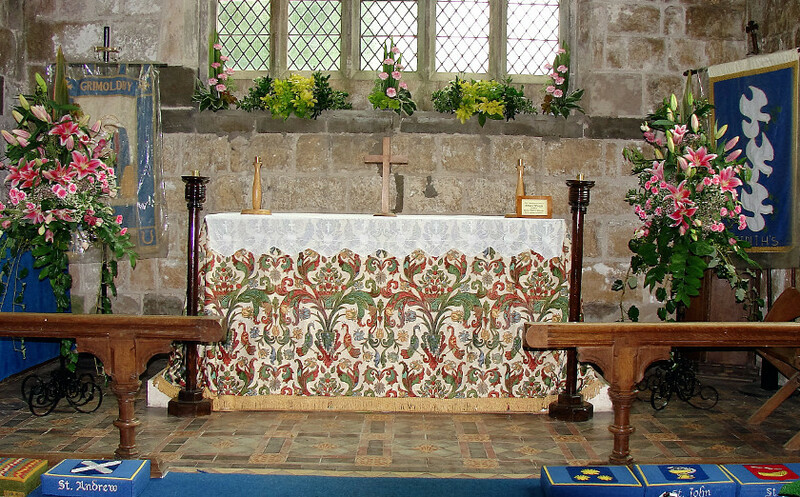 In August we have two opportunities for mutual support over the August Bank Holiday: the Dog Show at St Leonard’s, South Cockerington and the Flower Festival at St Helen’s, Theddlethorpe, with a Songs of Praise service at 6 pm on the Sunday. This entry was posted in Blog on August 15, 2017 by Janet McKee. In July 2016, we had been banished from our building, so that essential work could be done. But this year, in July 2017, in the week of our Patronal Festival, the work had already been completed, the church had resumed its pattern of worship, and the Saturday Shop had returned and was flourishing. On July 8th, we went on pilgrimage to Walsingham, with thankful hearts. We had a wonderful day, with plenty of time to relax in the beautiful garden at the shrine, or to walk around the village. Back in Grimoldby, we had to get busy again. We held a Flower Festival from Friday 14th until Sunday. Christine Baxter had organised this, with help from friends at two of our sister churches, at Saltfleetby and Theddlethorpe. In addition to the display of flowers, the WI, the Honeysuckle Club, Little Lambs, and Grimoldby Primary School had displays of their activities. On Friday evening, the Somercotes Singers gave a concert of well-known songs, much enjoyed. The festival continued through Saturday and Sunday when, in the morning, we had an informal service of Songs of Praise at which everyone had a chance to choose a favourite hymn. So, it was all over – but not quite. In the coolness of the church, the wonderful flowers continued to bless us for many days. This entry was posted in Blog on August 11, 2017 by Janet McKee. We are making progress in preparing the Parish Profile, which is needed before the recruitment process for our new Rector can take place. If you have any views on how we can grow as a group of seven churches, please let a member of the PCC know your ideas/views. When representatives of all the church PCCs met, we agreed to organise a series of informal social gatherings, and a list will be published in the August news sheet. This should help to maintain contact and provide an opportunity to get to know each other better and exchange ideas. It was also agreed that the Holy Communion service on the fifth Sunday in the month would be a Benefice Holy Communion, and we would like to invite as many as possible of the regular congregation from each church to join in this service. The first one will be at 10.30 on Sunday 30th July, in St John the Baptist Church, Great Carlton. This entry was posted in Blog on July 1, 2017 by Janet McKee. Thank you to everyone who came to Chris Turner’s last service and brought food to make it such a memorable occasion. We are starting to prepare a Parish Profile, looking to the future, and your PCC would welcome any comments on how our churches can evolve and grow. This entry was posted in Blog on June 1, 2017 by Janet McKee. As we enter a period of interregnum, with the departure of Chris Turner, after his ten and a half years of very special ministry, we are trying to maintain communication by continuing the monthly news sheet. 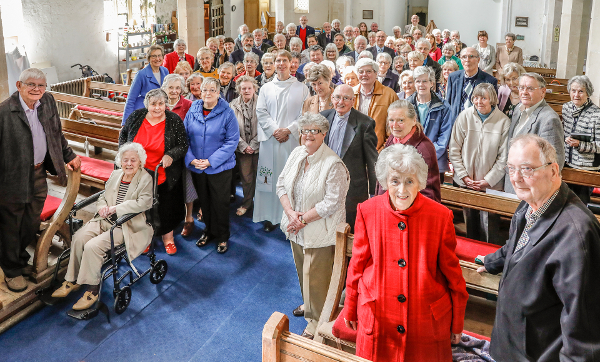 The aim is to continue the established monthly pattern of one service of Holy Communion in each church, by using retired clergy living in the area. This entry was posted in Blog on May 1, 2017 by Janet McKee. As some of you may know, I am leaving for a new post. I have been appointed as the vicar of the Church of the Good Shepherd in Borough Green, near Sevenoaks in Kent. I would like to take this opportunity to say, thank you. It has been a great joy and privilege walking alongside you in your faith journey. This was not a part of the country Lorraine or I knew before we arrived, and we found a wonderful welcome and generous hearts. Over the ten and half years we have been here, we have made many friends, and sadly lost some too, there have been some great successes and some things that didn’t go to plan, but through it all I have seen God at work. My last service in these parishes will be Sunday 30th April at 11:15 in St Edith’s Grimoldby. After the service there is a bring and share lunch at the Grimoldby and Manby village hall. Everyone is welcome to join us. I will be licensed at the Church of the Good Shepherd on Wednesday 24th May, at 7pm, by the Bishop of Rochester. It is a long way down to Kent, but if anyone does want to come to that service it would be great to see you there. Before all that we will be celebrating Easter. This is the season when we think of endings and new beginnings. The cross brought an end to the old order, an end to slavery to sin, and the resurrection brought a new creation, new life in Christ. So as we reflect on the cross and the empty tomb, we remember that God can make flowers grow in the desert, water flow from the rock, turn death into life. So, changing us and our future is a relatively small task for the almighty. This entry was posted in Blog on March 30, 2017 by Janet McKee. Just a quick update on the work at St Edith’s. Firstly a big thank you, to all those who came and helped with the clean up before Christmas. Lots of moving, dusting, hoovering and mopping involved, but it was great to be able to have our Christmas services in the Church. 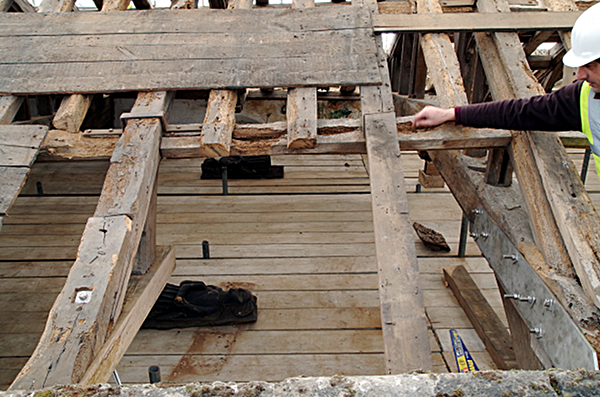 The nave and aisle roofs are now finished, along with the associated timbers and stonework. The porch roof needs to be completed, but the scaffolding will be coming down very soon. 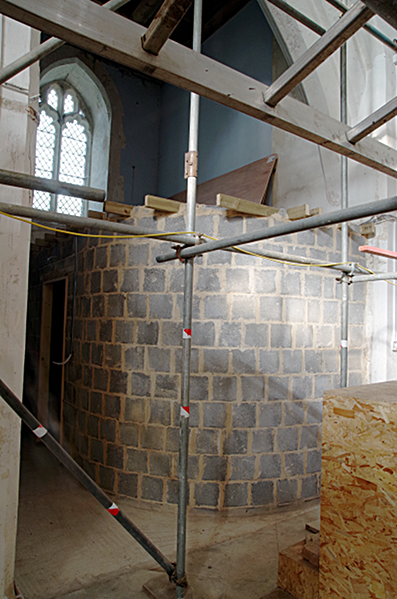 Inside, the tower has been ‘opened up’, so that we can now see the west window, and the new toilet facilities have been installed. 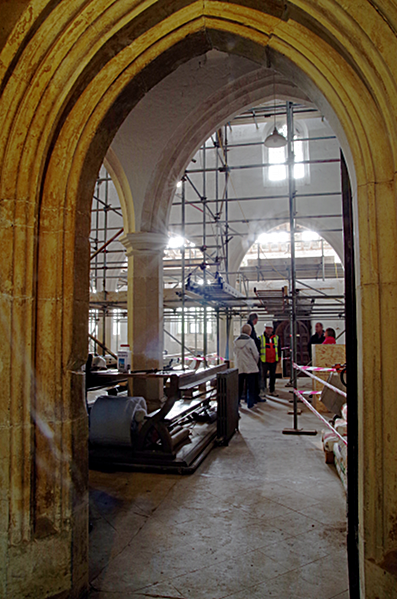 The final part will be to fit the servery along the west end of the north aisle. 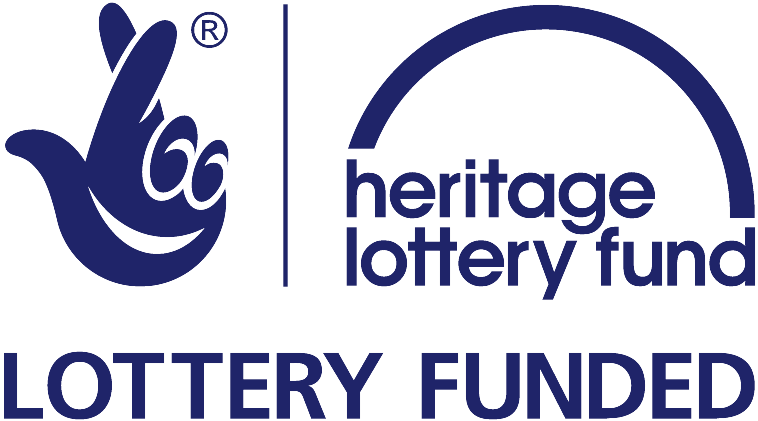 The last part of the project will be to produce some information boards and leaflets, telling people about the church and the work done. This all means that we should be back in church for March, with the regular worship and with our Saturday Shop up and running. There will still be work we need to do, but that will be for the next project. Thanks to all those who have taken such an interest in the church, and for your patience while it’s been going on. This entry was posted in Blog on February 1, 2017 by Janet McKee. The ‘Hard-hat day’ on 15th October proved a great success and was greatly appreciated by all who attended. Here are some of the highlights. Architect Chris Mackintosh-Smith (in the high-vis) showed the many visitors what wonders are being achieved. 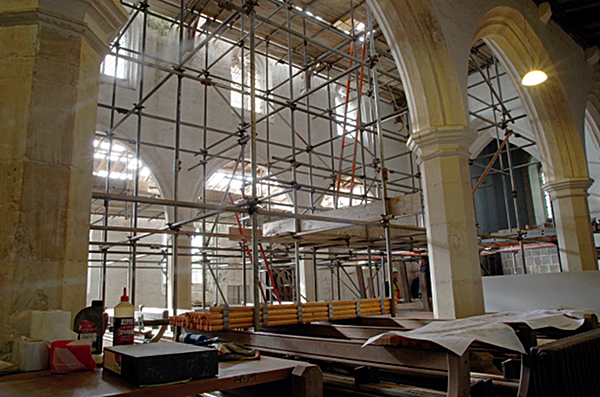 The nave is scaffolded to support a crash deck below the roof. Where, usually, only angels dare to tread. Beneath the tower, the new accessible facilities are taking shape. 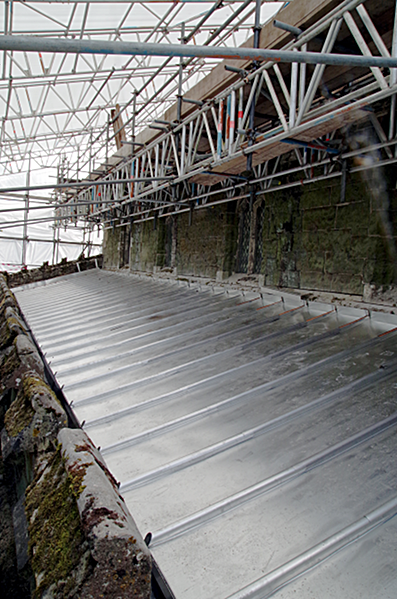 The north-aisle roof is already reclad in stainless steel. 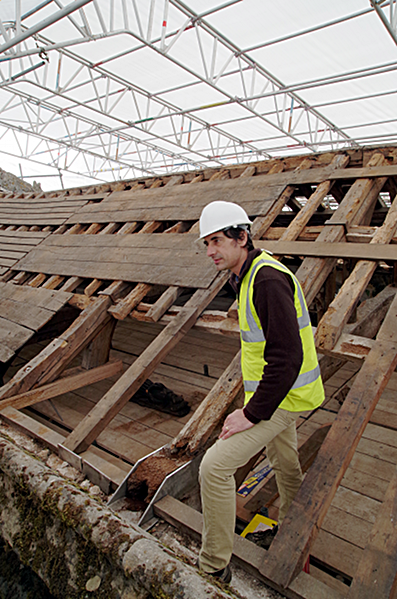 While the nave roof is undergoing extensive reinforcement. 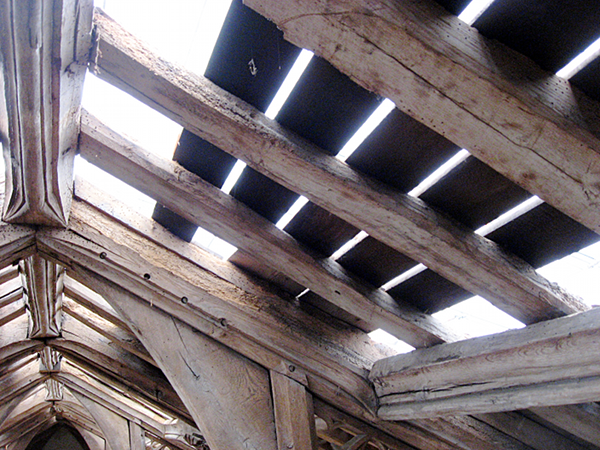 Ben Peek showed how custom-made stainless-steel supports are bolted into the sound parts of the historic timbers, to preserve as much of the original structure as possible. While the thirteenth-century angels get a well deserved rest, awaiting conservation. More photos will be added to this blog post, as we gather them. This entry was posted in Blog on October 15, 2016 by admin. The scaffolding is all up. Those of you who saw the array of scaffold-laden lorries will have an idea of how big a task that has been. They need to go high enough to allow them to construct secondary roofs over the church roofs, to keep the elements out when they remove the slates, etc. 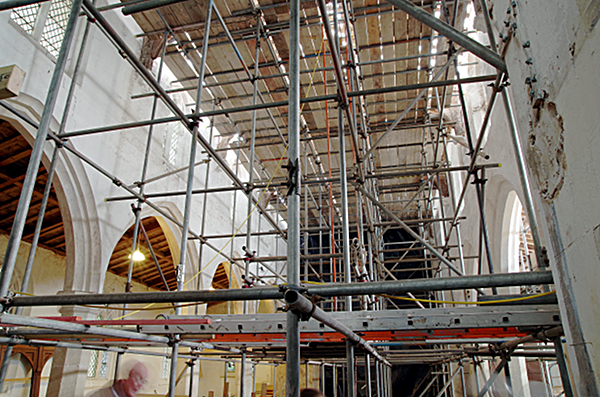 Also the inside of the church is now filled with scaffolding to provide a crash deck in case anyone puts a foot wrong! This all took some time, and in its own way is a thing of beauty, but now the work proper has started, hence the skips being filled and taken away as old material is removed. The base of the tower has been cleared, removing the old kitchen, toilet and screen. This has allowed us now to see the west window and has created a wonderful space, and given room for proper disabled facilities to be installed. 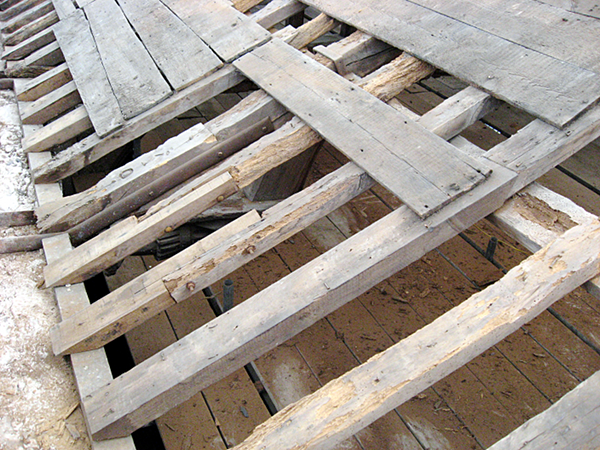 The work on the roofs, timbers and stonework has uncovered a few surprises, some good, and some not so good. 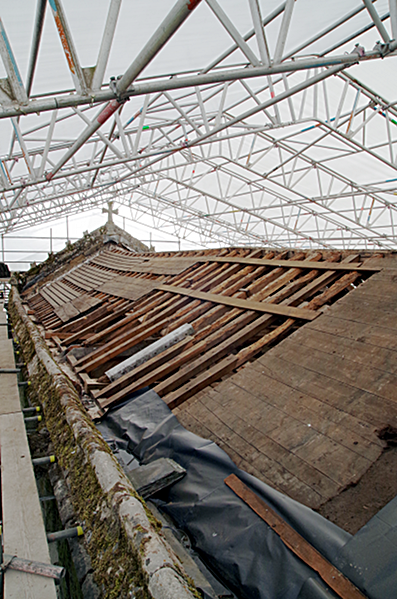 The roof timbers the nave (the main part of the church) are not in as good a condition as we hoped and in places, where they connect to the walls, we will need some steel plates made to provide extra support. On the plus side, the roof slates are in a much better condition than first though, and nearly all of them can be reused. These plusses and minuses mostly cancel each other out, so we are still on track to open before Christmas. Thank you for your patience while the work is taking place. I know people are interested and wanting the church open for business again. We’ll keep you up to date and look forward to a grand reopening. This entry was posted in Blog on October 2, 2016 by admin.